Hunger climbs your insides like a cat on a tree, all claws and swift, and you stare at the huge gem in the cold fire-lit, mountain hall. 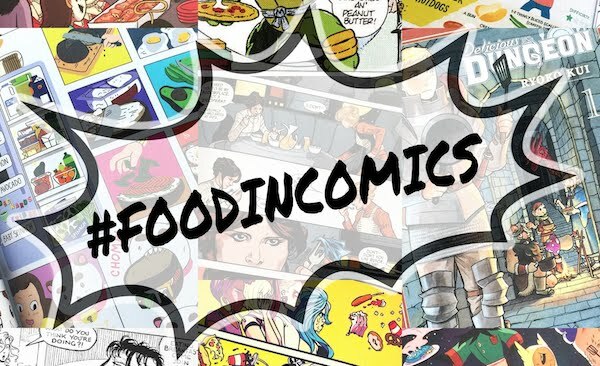 You've gotten the hang of summoning food; let the visions and smells and textures–the memories and expectation–flow over your mind and out your fingertips, into the stone. Somehow it works. But the other boys aren't so lucky, and you're not supposed to help. Gerrard steps up to the stone as you sit at a nearby table trying not to devour your fluffy griddlecakes in one go. He sees you watching and the furrow of his brow deepens. He shifts in his ragged robes, almost imperceptibly, letting you know he doesn't want an audience, but also betraying his anxiety. He closes his eyes and stretches out his fingers to the stone. He breathes in the pattern we were taught. His eyelids squeeze tighter and his hand twitches. The bright blue light of the stone flashes off his perspiration and the sound of the ocean rises and rushes out. A steaming bowl appears on the pedestal. Gerrard opens his eyes and lowers his stiff hand. A momentary look of doubt is filled up with relief and pride and quickly cast away by hunger. With gathers of robe he grabs the hot bowl, eager but careful not to spill it, and sits at the opposite end of the table where you are licking the syrupy crumbs from your plate. He tucks his head over the stew and inhales. His eyes flick to you, then close as he tilts the bowl and slurps a steaming mouthful; hunger abated, at least for the moment. "A rich lady bought me a dish of fish stew once..."
"Fish stew? In a broth?" He nodded. 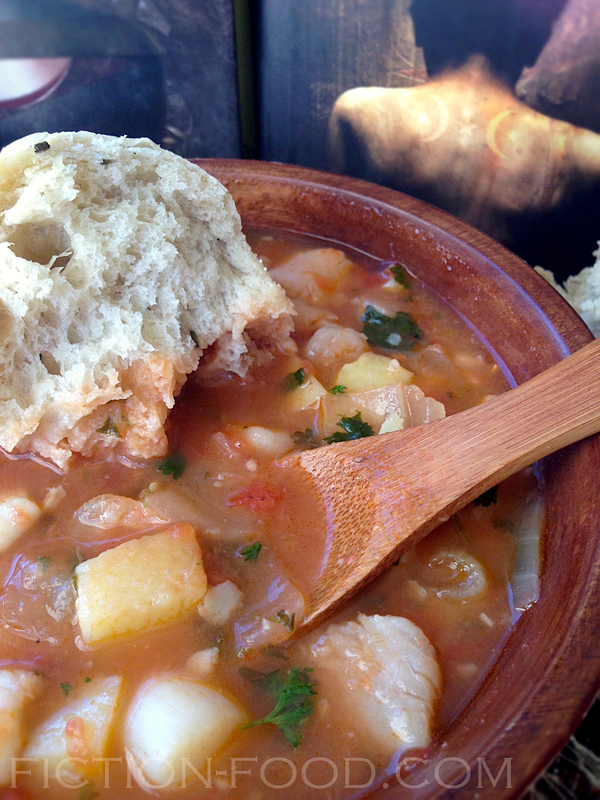 "Thin, reddish broth. It was wonderful. Onions. Potatoes." 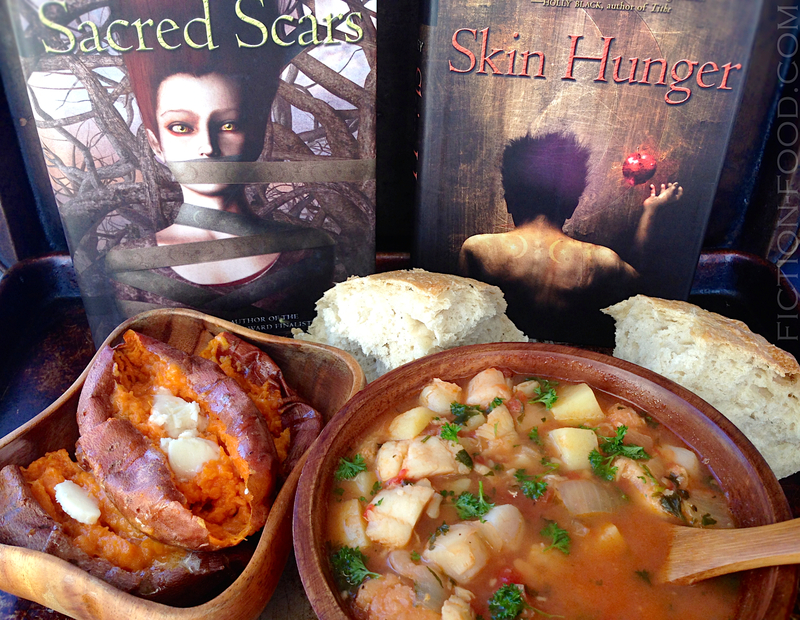 The Resurrection of Magic Trilogy by Kathleen Duey, beginning with Skin Hunger, continuing with Sacred Scars, and concluding with an as of yet unfinished book, is a rich and raw submersion of story that wraps itself around both your heart and mind. 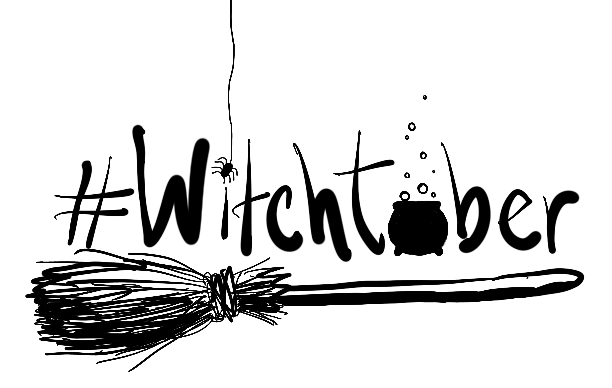 It is a time converging, magical mystery saturated with themes of the human condition, many times pricking at your understanding of what makes us tick and unravel. 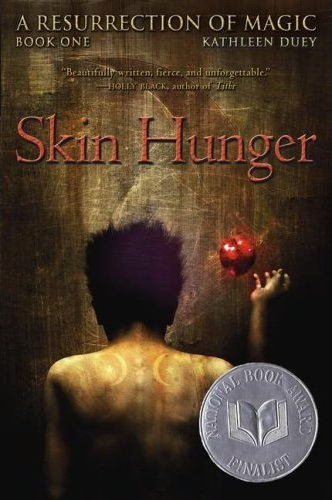 For my review of Skin Hunger, please click here. 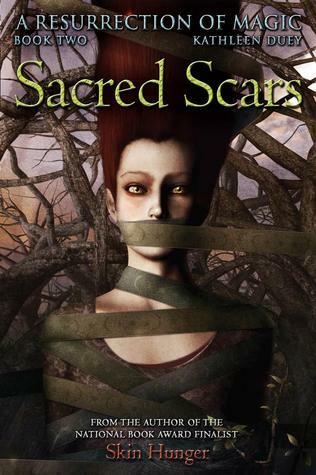 I did read Sacred Scars, and was enthralled by it, but didn't write a review. I was probably too overwhelmed...or too busy thinking of this recipe. 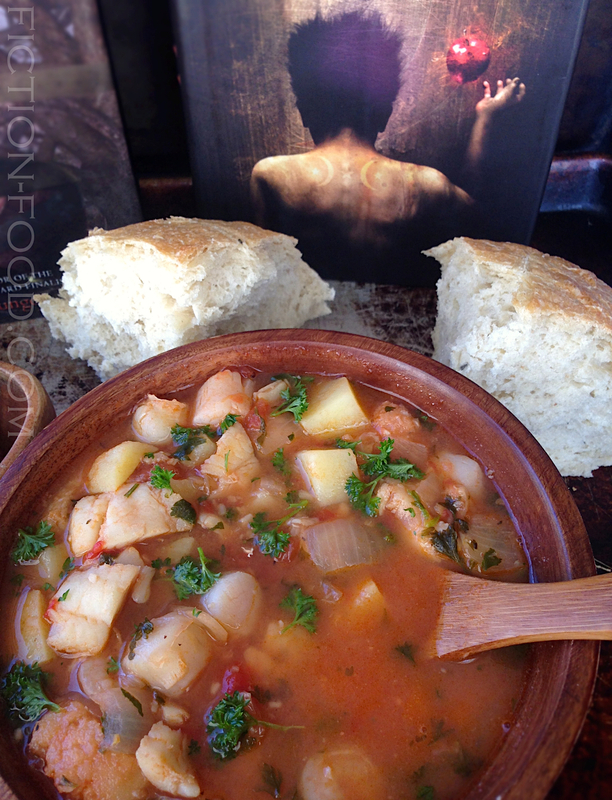 Gerrard still makes fish stew in the second book, but adds buttered, baked yams and bread to his meal. Note: The yams take a while to cook so I suggest you pop those bad boys in the oven first and then get started on the stew. 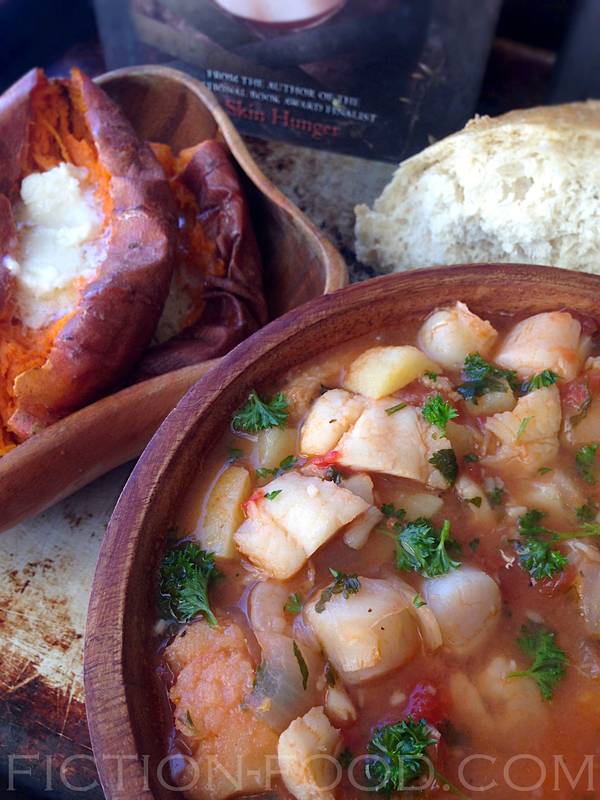 The stew and yams will finish about the same time, or within a few minutes. 1. Yams: Preheat your oven to 400ºF. Wash & pat the yams dry. Poke them with a fork a few times on one side & lightly oil them. Place them, poked side up, directly on the middle oven rack, with a large baking dish or tray on the rack beneath them (to catch any drips) & bake for about 40 minutes or until a fork can easily puncture through. Remove from oven to a serving plate. 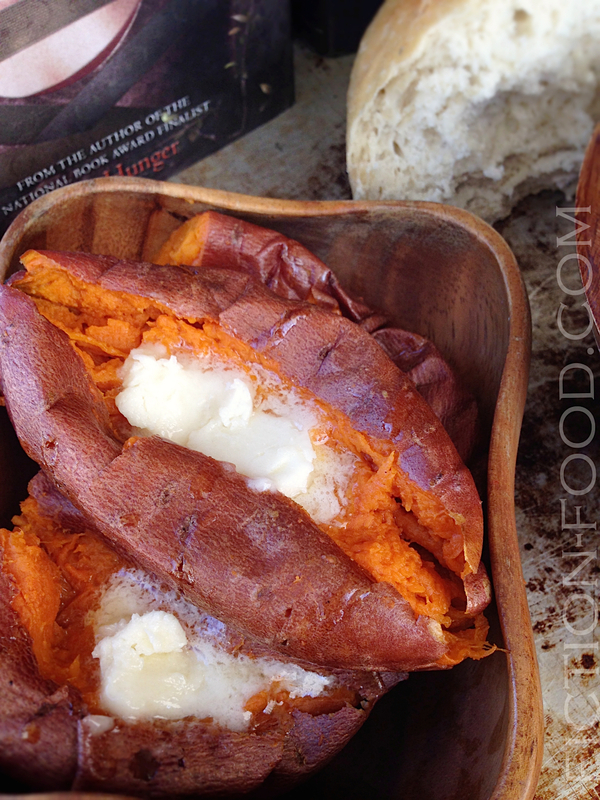 Split the yams open & add in butter to your liking. 2. Stew: In a large, deep pan on medium heat, sauté the diced onion in the oil until soft. Add the minced garlic, salt, & pepper & stir to combine. Stir in the parsley, cilantro, & bite-sized potato pieces, & then pour in the fish stock (either dashi powder dissolved in water OR oyster juice combined with water). Cover & simmer on medium low until the potato bites are a little soft, about 20-25 mins. 3. Pour in the cup of tomato juice from the can of whole tomatoes & then add in a cup of those tomatoes, squished by hand. Cover & simmer 5 minutes more. Stir in the shrimp, scallops, & fish & cover again, raising the heat slightly to medium high, & cooking for 10 more minutes. Remove from heat & let sit for about 10 minutes before serving. Serve alongside the buttered yams with some nice, break-apart bread. 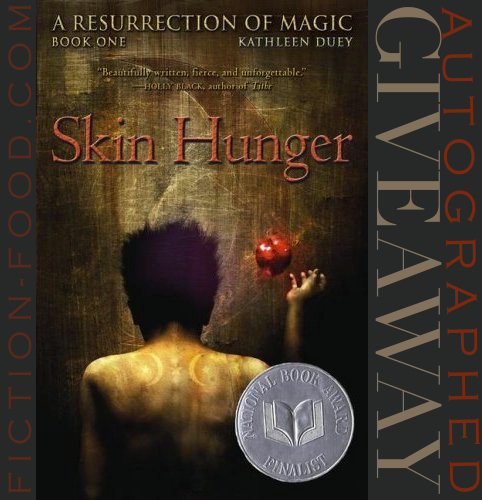 Win an autographed paperback of Skin Hunger, book 1 of A Resurrection of Magic by Kathleen Duey, by filling in the Rafflecopter form below. This giveaway is open to US residents only and will end Nov. 17th at 11:59 PM PST. Good luck! This book sounds right up my alley. The food looks delicious. I will have to give this recipe a try and read this series. *Forgot to add* If I could conjure food I had fond memories of I think I would conjure something from Paris. Probably the honey glazed duck breast, with mashed sweet potato/carrots, side salad, and dessert sampler, plus a cup of Marco-Polo tea. It was the best meal I had ever eaten right outside Notre Dame on a boat-restaurant in the Seine. It was raining and cold, but there was magic. The memory of that meal is seared in my mind. Cheesy mashed potatoes! So good. If I could conjure up any meal, that will be my mother's papa rellena and pernil. <3 Papa rellen is potato stuffed with meat and pernil is pork. We usually have pernil for Thanksgiving and New Year's so since it's coming to be around that time of year again, I am really looking forward to eating it again. If I could conjure up that meal from the stone, I would always be filled, not just my tummy, but with fond memories of the holidays.